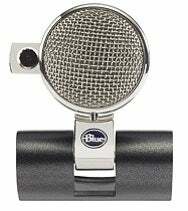 Blue Microphones is perhaps best known for their line of distinctive USB microphones, including the Snowball and the Snowflake. At Macworld Expo they're showing off two new products that a little bit outside of the norm for the company: a webcam and an iPod recorder. The Eyeball, as you might guess, is a USB webcam with integrated microphone. It looks like someone lopped off the top of a stage mic and then slammed a webcam into its side (which is not a bad thing, I think it looks pretty cool). The Eyeball comes with an adapter so you can perch it on your MacBook, without having to worry about it falling off. Speaking of worrying, if you don’t want anyone to see you while you’re using the Eyeball but you still want to be heard, the webcam even retracts into the body, leaving you free to take off your pants and relax a little. The Eyeball is available now for $99.99. Now, Blue Microphones doesn’t want your iPod to feel left out so they are also introducing Mikey, a portable recorder that attaches to your iPod. Attach Mikey to your iPod’s Dock connector and you’re ready to record up to 1.5 hours of continuous audio. The Mikey gives you three different gain settings to choose from, so you can get the best-sounding audio possible. When you're done with your recording, the Mikey doubles as a speaker so you can play your audio back right from the iPod without having to find your headphones. The Mikey will be available in February for around $80.